2) What are the advantages of spring framework? 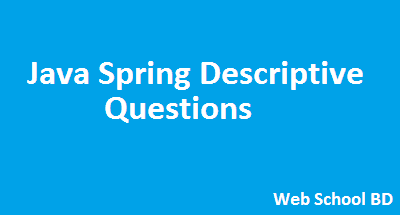 3) What are the modules of spring framework? 4) What is IOC and DI? IOC (Inversion of Control) and DI (Dependency Injection) is a design pattern to provide loose coupling. It removes the dependency from the program. Let's write a code without following IOC and DI. Now, there is dependency between Employee and Address because Employee is forced to use the same address instance. Let's write the IOC or DI code. Now, there is no dependency between Employee and Address because Employee is not forced to use the same address instance. It can use any address instance. 5) What is the role of IOC container in spring? 6) What are the types of IOC container in spring? 7) What is the difference between BeanFactory and ApplicationContext? BeanFactory is the basic container whereas ApplicationContext is the advanced container. ApplicationContext extends the BeanFactory interface. ApplicationContext provides more facilities than BeanFactory such as integration with spring AOP, message resource handling for i18n etc. 8) What is the difference between constructor injection and setter injection? Overrides the constructor property if both are defined. 9) What is autowiring in spring? What are the autowiring modes? Autowiring enables the programmer to inject the bean automatically. We don't need to write explicit injection logic. Let's see the code to inject bean using dependency injection. this is the default mode, it means autowiring is not enabled. injects the bean based on the property name. It uses setter method. injects the bean based on the property type. It uses setter method. The "autodetect" mode is deprecated since spring 3. 10) What are the different bean scopes in spring? The bean instance will be only once and same instance will be returned by the IOC container. It is the default scope. The bean instance will be created each time when requested. The bean instance will be created per HTTP request. The bean instance will be created per HTTP session. The bean instance will be created per HTTP global session. It can be used in portlet context only. 11) In which scenario, you will use singleton and prototype scope? 12) What are the transaction management supports provided by spring?